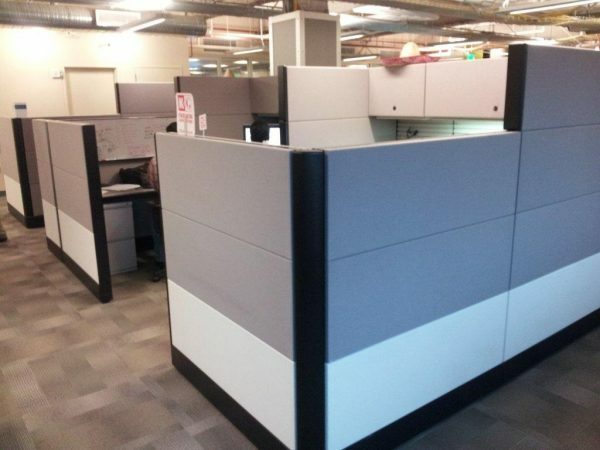 Herman Miller Ethospace 6×8 workstations. There are 70 of these stations with 70″ high panels on the spine, step-down to 54″ high. The 4″ thick tiled panels have metal, fabric and slat wall tiles. Stations come with overhead shelf and bin and a BBF and FF pedestal. Paint trim is black with gray fabric. Power down the spine panels with base-in feeds. Good as-is condition.